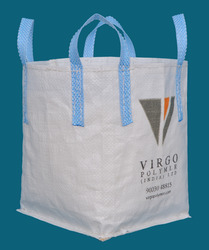 We are well acclaimed as a prominent firm engaged in fabricating highly demanded Jumbo Bag. These bags are cost effective and most reliable product for packaging and transportation of industrial goods. Made from finest grade polypropylene fabric these sturdy bags are made with advanced flat loom techniques. Featuring reliable loops secured with lock stitch technique the offered bags can be ordered from us at a market leading price. Looking for Jumbo Bag ?